The La Caja China roasting box is a fairly unique cooker, especially if you’re used to the traditional smokers and/or spit roasters. The best way to describe it is a giant Dutch Oven. It’s a large rectangular box that’s constructed out of aluminum lined plywood. A butterflied roasting pig gets sealed inside, and then a charcoal fire is lit on the racks sitting on top of the box. The heat from the fire presses down on our little piggy friend, cooking him to perfection in a mere 4 hours!!! 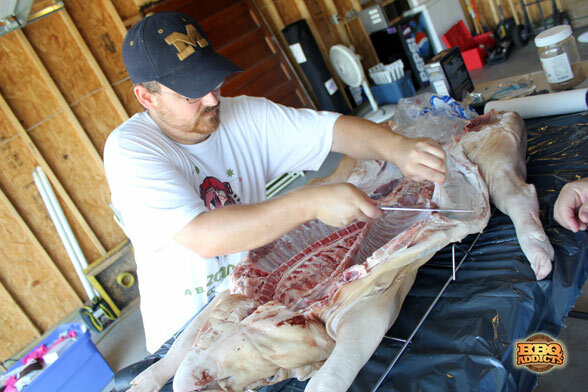 So, the first thing to do when planning a pig roast is to line up a supplier for your pig. I happen to have a connection to a Berkshire pork processor up in Iowa, so I made a call to my contact at Berkwood Farms. I let them know that I was looking for, and then 3 days before the big cook I had my very own Berkshire pig. 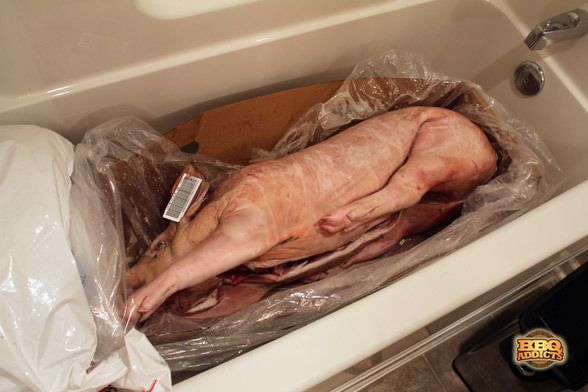 The pig arrived frozen solid, so I iced him down in our bath tub to slowly thaw out over the course of a couple days. (This is the part where I need to thank my wife. Needless to say she was a bit hesitant when I told her that I wanted to thaw a dead pig in our upstairs bathroom, but she understands my addiction and was more than willing to sacrifice our guest bathroom for the weekend. The key to thawing the pig, especially in a bathtub for a couple days, is to keep him on fresh ice. He (for some reason I refer to the pig as a he) was wrapped in a large plastic bag, so I kept him inside the bag during the thaw. The ice was then packed around the outside of the wrapped pig, and I left the drain open to prevent any standing water from forming. The tub ended up holding the cold temps really well, so I didn’t go through near the amount of ice as I was planning. Every 6-8 hours I would check in and add more ice as needed. The morning of the roast we took the pig out of the ice and carried him outside to get prepped for the cooker. To make sure he was good and clean, I gave the pig a good rinse with some water before putting him up on the prep table. Once on the table he needed a little knife work before being ready for the box. 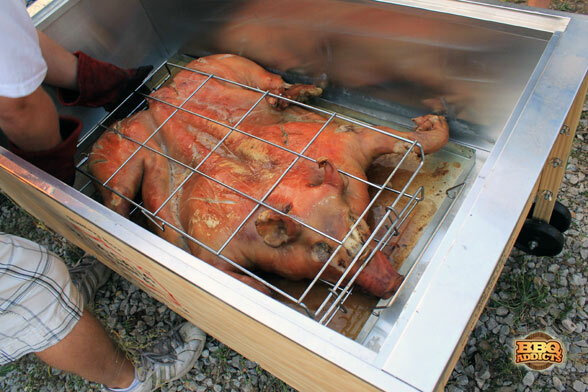 In order to evenly cook inside the La Caja China, then pig needed to be butterflied to lay flat. 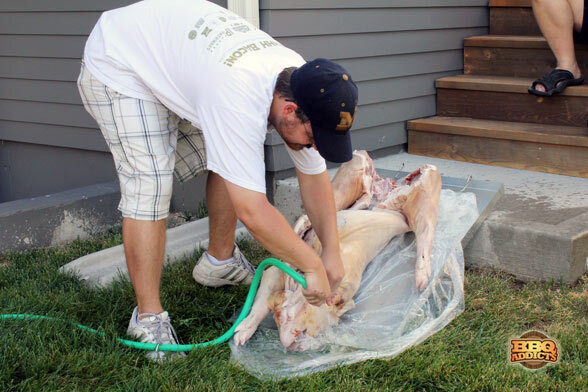 To do this, we laid the pig on his back and the I used a large chefs knife and a rubber mallet to split the spine between the two front legs. The cut I made ran a majority of the length of the ribs, but I imagine this could vary depending on the size and anatomy of each animal. I also removed the membrane from the ribs and trimmed off any small hanging pieces of fat. After trimming we injected him with approximately 1 gallon of our competition pork injection, focusing mainly on the shoulders, hams, and loin. All I had available was a few small hand injectors, so this took a little longer than I was planning. Before my next pig roast I will be investing SpitJack Injector Gun or a Chop’s Power Injector System. This will save lots of time, and some hand cramps! Once injected, I rubbed the entire pig with hefty coating of kosher salt following by a layer of BBQ Rub all across the cavity. Once the pig was fully seasoned, we wrapped him back up in plastic with ice bags on top and let him rest for another 4-6 hours to absorb the flavors of the injection and rub. 2 hours before the roast started, I pulled the ice bags off the pig to let him come to room temperature. It was a pretty hot that day, and I had my prep table setup in the garage, so it didn’t take long for the pig to come to room temperature. If you were doing this process in an air conditioned room, then you may need to let the pig sit a little longer. In hindsight, this is the point at which I made a mistake. 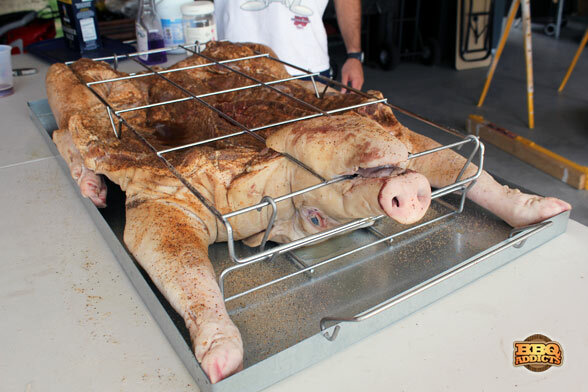 Before lowering the pig into the La Caja China roasting box, you’re suppose to secure him inside of a wire rack to help keep him splayed out. Unbeknownst at the time, I had actually secured the racks upside down, which is why there is a bar running through the pig’s mouth in the above picture. Instead of the racks acting as a cage to hold the pig together, they act as risers to lift the pig 2-3 inches off of the drip pan. This then allows the hot air to circulate underneath the pig during the cooking process. This was definitely an important detail, so take note of this if you plan to do your own pig roast. After sealing the pig inside the La Caja China, all you need to do is follow the simple instructions conveniently printed on the side of the box. 16 pounds of charcoal were lit initially, and then more was added per the recommended timings. After 3 hours of roasting, the pig is then flipped to expose the skin side to direct heat. This makes it nice and crispy! The flip is when I noticed that something wasn’t going as planned. This is the point in the process where you are supposed to score the skin with a knife. The instructions and La Caja China YouTube videos showed this happening with relative ease. The first slit I made went great, but the skin near the center wasn’t quite as tender as I was expecting. I was able to cut through the skin, but it required a bit more umph than the edges. This was because the skin was in contact with the drip pan, so the heat wasn’t able to circulate under the pig. 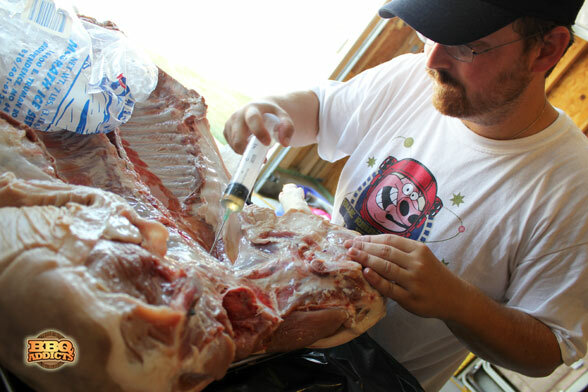 To make up for the less than tender skin, I let the pig roast a little longer than the recommended time after the flip. After about another hour, the skin became nice and crispy and we were able hoist the golden brown pig from the roasting box and place him on the serving table. The final product was moist and juicy, and the rendered pork fat flavor was unmatched! The only issued caused by my oversight with the rack was that the meat wasn’t quite as tender as I would have liked. It never reached the point of being able to pull the meat cleanly from the bone, so we mostly enjoyed sliced pork. Regardless, it was absolutely delicious! I was really surprised at how well the flavor of the rub penetrated the meat. The heat of the roaster really activated those flavors, and they were absorbed by the entire hog. All in all, my first La Caja China pig roast was a resounding success! I learned a few lessons along the way, and have a game-plan in place for making my next roast even better. Special thanks to everyone who came out for the birthday bash! I can’t think of a better way to spend my 30th birthday than cooking for 100 of my closest family and friends! Looks like you nailed it on your first try, beautiful pig! I love the “pig in the tub” picture, I have a couple just like that, lol. I forgot to tell my wife about it the very first time I did so…I haven’t forgotten again. I think I’m going to see if Roberto will start a “bath-tub” photo album on the FB page, lol! Looks like a great roast, happy belated birthday! Between you, Perry, and Jaden (Steamy Kitchen), you guys are making me want a roasting box. Chris, you won’t regret it! Lemme know when you get one and I’ll send you a complimentary copy of La Caja China Cooking! I have been researching this famous box “La Caja China” and reading many amazing stories for a month now and I am hooked. Mr. Perkins you have inspired me and I thank you for your efforts to educate us on this wonderful box. I will be cooking my first suckling pig next weekend. I’m loving this posting and thank you. I’m roasting my first pig on August 30th, in two days. How big was your pig?? Mine is 73lbs. and I’m having trouble finding the flip times vs. actual sizes. Any suggestions? Mine was about 65 lbs dead weight. My box has instructions printed on the side that indicate times for the entire cooking, including changes for the weight of the animal. If you just follow this instructions exactly, then you should be perfectly fine. The other option is to insert a temperature probe into the thickest part of the hams or Boston butts. It will be fall off the bone at 195 degree, so you could probably flip it at around 180 degrees. Agreed, just follow the box instructions to get “slice-able” pork. If you want more of a pulled pork, double the cook time. I usually go for the longer time, basting heavily, and draping the pig loosely in foil at the four hour mark. Flip the pig 45-60 minutes before your estimated finish time, and you’ll be fine. Got my box a few weeks ago but haven’t been able to use it yet. Looking at doing my first pig soon but not soon enough after reading this. That La Caja China Cooking book sure would come in handy…. Just ordered my box today. Now i just need to find some great recipes and i’m on my way. I’ve been to pig roast’s were a rotisserie was used and once when they buried the pig in the ground. The results were always delicious. This is the first time I’ve seen it done in a box. definately worth looking into. Thanks for an informative post. Looks great..some friends and I bought a used #2 from an estate and we are using it on the 29th for the first time. We ordered a 80 – 100 lb pig and it will be headless and skinless. Any suggestions or hints would be greatly appreciated. Yes, a late reply, but why skinless? That’s by far the best part! This one had the skin on it. It just didn’t crisp up as much as I would have liked. So glad to see things going down the old school, whole hog roast way! I used to work in a kitchen for two years – one of the best places to eat in New York – and we had a Hawaiian pig roast for some clients. 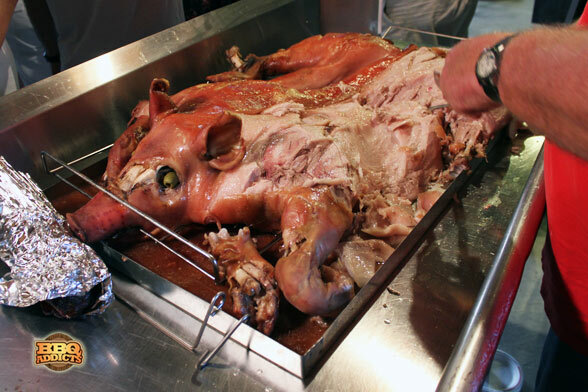 It was amazing – We roasted 4 pigs and eating that succulent meat was outrageous. So happy to find this blog – BBQ is undeniably my favorite! Like you, I appreciate good food and better ingredients. I have created a Pig Infographic at : http://www.cellpig.com/pig-facts explaining why they are so delicious and under appreciated. I was wondering if you minded sharing it on your blog to help spread the word? The embed code is at the bottom. Thanks, good practical info w/easy to follow tips & suggestions which is great since I’m cooking/roasting my first pig tomorrow for a group of close friends. Fortunately, these guys will tell me good to go or Piggy needs some work. Surrounded by all day and all night smokers, “The Box” is going to blow them away. Photos and log to follow. Wow that looks amazing. I love the idea of the box as you can take it anywhere with easy, providing you’ve got a truck I guess. These things look freaking amazing. I have a small smoker in my back yard, but something like this is on a whole other level. I have never heard of these. Even if you double the cook time to 8 hours that is still a fairly “quick” cook for a whole hog. Have you learned any new tips since doing your first one, last August? I have never tried to q a whole pig looked a little overwhelming but i think i could actually do this. Your roasted pig looked awesome! I love the pig in the bath tub my wife would go crazy Lol! It looked liked a body! Great post I am going to have to buy a La Caja china and try it for my self. Is the pig rack stainless steel or galvanized? A good way to marionate a medium size pig is in one of the large, stiff, plastic clothing storage boxes, like the ones you store under the bed. Some of these have wheels that make it more convienent. After usage, you can take it outside for cleanup. Much easier than a bathtub, and it does’nt gross out the wife. Howdy from Fort Collins, CO! Great description. I’m using this to help me through my first roast, which is next week. I do have a couple of questions, though. 1. What is the proper preparation and disposition of the head? Do they typically come with the eyes and brain in place? Is any of this removed before cooking and is there use to which it can be put afterward? 2. I have ordered a 75 lb. pig for about 45 people. We are also frying a turkey, but I’m a bit concerned about having enough pork. Many of those attending (say, a third) are kids between 5 and 14. Should I up it to 85 lbs? 3. how important is a thermometer? Thanks for any input. My plan is to use the Mojo recipe published on the La Caja China web site (used it for the chicken) and rub with Adobo purchased from the Latin Touch web site. I just bought a used one and wanted to know how hot it gets at the bottom of the box between the bottom and the ground. I would like to do this on a deck but did not know how hot it got and if it would be safe. Also do you have any homemade rubs that do not have as much salt in them. I recently cooked my 1st whole pig on a La Caja China. I went on-line to review every comment and suggestion I could find to help with my 1st attempt. The pig turned out great, however, it took longer than I had anticipated. I expect one reason is due to the fact that I didn’t get the pig close enough to “room temperature”. I kept the 83 Lb. pig in my garage, in the cooker on bags of ice. The morning I was cooking the pig, the outside temp was 35 degrees. When I started to cook, the pigs internal temp was 48 degrees. I understand that would increase cooking time, however, I have another issue. Everything I had read talked about not getting the internal temp of the La Caja China high enough. The main reason was due to lifting the lid and checking the pig. My issue was that the internal temp got too high. My thermometer told my the temp of the pig (probe was in the ham) and the temp inside the box. I started with 18 lbs of charcoal and added 10 lbs after the 1st hour. During this time the internal temp max was 325 deg. After the 10 lbs of charcoal was added the internal temp went as high as 450 degrees and I started to smell burnt pork. I lifted the lid and the entire exposed underside was starting to burn and char. I covered the pig with tin foil and started to “regulate” the temp by slightly offsetting the lid to let some heat escape until I got back to the 325 to 350 range. I had to do this continually until I flipped the pig to crisp the skin. The total time to cook the pig was 6 hours and I went through almost 80 lbs of charcoal. Any suggestions on my next attempt? Great looking pig, I’ve used to have a Caja China but lost it in a poker game. I sorely miss it. Wow! The pork roasted in such way will be cooked evenly. I would say that this barbecue grill is a great cooking tool. Thanks a lot for sharing. Frank, I’m the author of the two La Caja China cookbooks and, though I can’t tell you why, lol, I would recommend holding out until late Spring, if you can. Just received an email my La Caja China #2 is being shipped! Can’t wait to try it out….Great post Jason ! 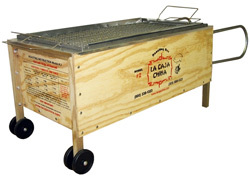 A buddy of mine has a caja china and I can’t wait to roast a whole hog this summer. Thanks for the tips! I am about to roast my second pig, and I came back to this page to come back up to speed on the work required. Here are some observations from my first roast and from using my box a few times since for smaller items. First, I thought the #2 box would roast a 100 lb *cleaned* pig. However, my first one was about 73 lbs, and it maxed out the box. 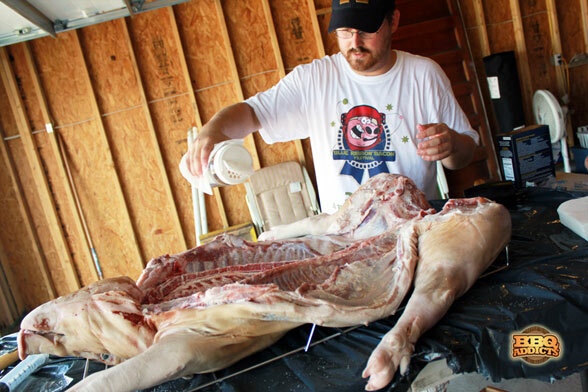 My understanding now is that the 100 lb limit is the size of the pig *before* it is cleaned and gutted. Second, roasting took longer than the table on the side of the box suggested. My suspicion is that this may have had something to do with getting rid of ashes. I will watch that more carefully this time. I will also schedule preparation and cooking to be complete 1 or 2 hours before we plan to eat. Third, I recommend you know your thermometer before you start and be sure you have a backup probe. It was a bit shocking to see how slowly the temperature was rising in our pig. Since the single use in 2012, my thermometer stopped working, hence the backup probe. Also, decide in advance what temperature you want to reach. I have found everything from 160 to 190 degrees on the web, and I *think* 170 is about right. This should be taken deep within the meat. Finally, the mojo flavoring from Perry’s book is great! So, I just learned about the box method today and I’m intrigued! The one question – does the meat get any smoke flavor? If so, how? What I think I understand is that the piggie is inside the box and charcoal on the outside. Is that right, or am I missing a step? Jo – No, the meat does not get any smoke flavor. It’s trapped inside the box while the fire is on top. There are different mods that allow smoke to make it’s way inside. Check out a device called Smoke Daddy. 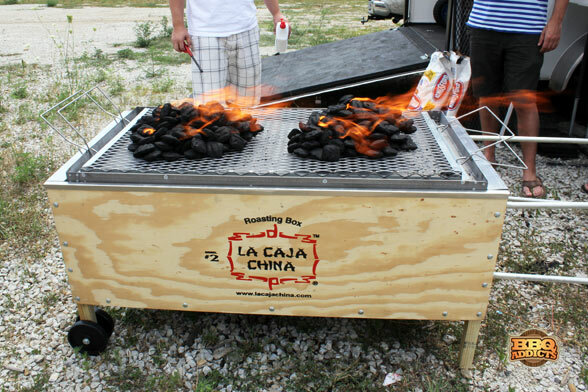 I also hear La Caja China is working on a version that will put smoke into the box. Liz – Bags of ice will help. There’s quite a bit of mass there, so it’s probably not warming up as fast as you think it is. Has anyone ever roasted a porchetta inside a caja? Thinking about roasting a couple of porchetta’s inside my box but can’t find any info online. Any tips or suggestions would be great. I have been using my box for the last five years for the lunar new year celebrations we have been having. It has been a lot of trial and error with the temperatures and cooking times. With the outside temperatures in January in Georgia at anywhere from 20-50 degrees I have had to make adjustments for the temperature of the pig and the roasting times. I have had pigs from 40-60 pounds. I have found that the pig is done at 165-70 but that has taken anywhere from 4 to 7 hours depending on size of the pig, internal temperature at the start and air temperature. Also – I have never yet gotten a pull-off-the-bone texture. It’s always been more like ham – some parts tender some tough – and that has been less appealing for many guests. This year I made sure I had a pig temp of 140 at the start – outside temp at 40 degrees – covered the top (rib side) with foil to prevent burning, and cooked the 40 pound pig to 190 in the hocks (5 hours total, including crisping the skin). Unfortunately, I still didn’t achieve the pull off the bone tender result I hoped for – still more like ham and the skin was too tough. Sadly, much of the pig was wasted since our guests couldn’t easily cut and plate it. Thinking this may have been my last effort with the box – next year I will go back to smoking just a couple of the shoulders with a good rub.